Syrian or Lydian subjects bring tribute from their satrap to Darius the Great of Persia. A satrap was a provincial governor during ancient Persian imperial times. Each ruled a province, also known as a satrapy. Satraps have ruled the various provinces of Persia in different periods for an incredibly long period of time, from the age of the Median Empire, 728 to 559 BCE, through the Buyid Dynasty, 934 to 1062 CE. At different times, satraps' territories within Persia's empire have stretched from the borders of India in the east to Yemen in the south, and west to Libya. Although the Medes seem to be the first people in history to have divided their lands up into provinces, with individual provincial leaders, the system of satrapies really came into its own during the time of the Achaemenid Empire (sometimes known as the Persian Empire), c. 550 to 330 BCE. 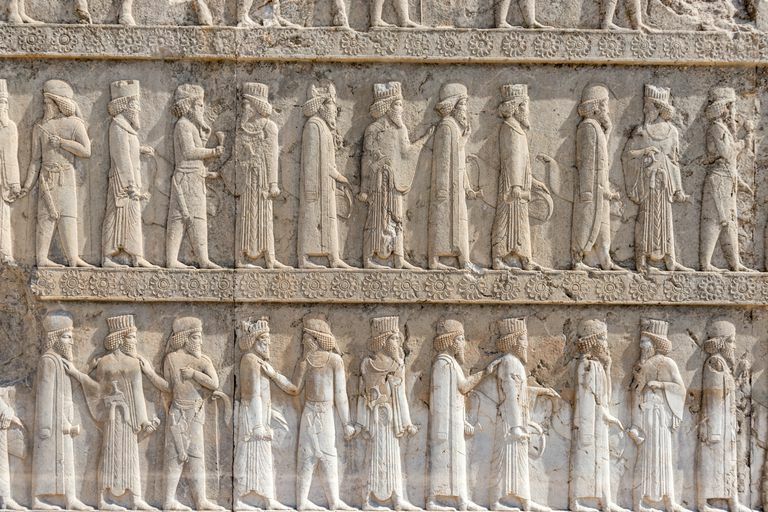 Under the Achaemenid Empire's founder, Cyrus the Great, Persia was divided into 26 satrapies. The satraps ruled in the name of the king and paid tribute to the central government. Achaemenid satraps had considerable power. They owned and administered the land in their provinces, always in the king's name. They served as the chief judge for their region, adjudicating disputes and decreeing the punishments for various crimes. Satraps also collected taxes, appointed and removed local officials, and policed the roads and public spaces. To prevent the satraps from exercising too much power and possibly even challenging the king's authority, each satrap answered to a royal secretary, known as the "eye of the king." In addition, the chief financial officer and the general in charge of troops for each satrapy reported directly to the king, rather than to the satrap. Under Darius the Great, the Achaemenid Empire expanded to 36 satrapies. Darius regularized the tribute system, assigning each satrapy a standard amount according to its economic potential and population. Despite the controls put in place, as the Achaemenid Empire weakened, the satraps began to exercise more autonomy and local control. Artaxerxes II (r. 404 - 358 BCE), for example, faced what is known as the Revolt of the Satraps between 372 and 382 BCE, with uprisings in Cappadocia (now in Turkey), Phrygia (also in Turkey), and Armenia. Perhaps most famously, when Alexander the Great of Macedon suddenly died in 323 BCE, his generals divided up his empire into satrapies. They did this to avoid a succession struggle. Since Alexander did not have an heir; under the satrapy system, each of the Macedonian or Greek generals would have a territory to rule under the Persian title of "satrap." The Hellenistic satrapies were much smaller than those of the Persian satrapies, however. These Diadochi, or "successors," ruled their satrapies until one by one they fell between 168 and 30 BCE. When the Persian people threw off Hellenistic rule and unified once more as the Parthian Empire (247 BCE - 224 CE), they retained the satrapy system. In fact, Parthia was originally a satrapy in northeastern Persia, which went on to conquer most of the neighboring satrapies. The term "satrap" is derived from the Old Persian kshathrapavan, meaning "guardian of the realm." In modern English usage, it can also mean a despotic lesser ruler or a corrupt puppet leader.